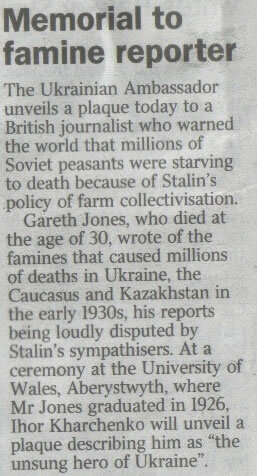 Plaque Honouring Welsh Journalist, Gareth Jones' Exposure of the Holodomor, Unveiled At University of Wales on 2nd May 2006. Following the Memorial Service in the University Chapel, with remarks by Lord Elystan Morgan [CLICK HERE], president of the University, and speeches by Ihor Kharchenko, Ukrainian Ambassador to London [CLICK HERE]; Professor Lubomyr Luciuk, on behalf of the Ukrainian Canadian community; Dr Margaret Siriol Colley [CLICK HERE] and Nigel Linsan Colley [CLICK HERE], relatives of the late Gareth Jones, the trilingual (Welsh, English, Ukrainian) plaque was unveiled in The Quadrangle of the Old College. 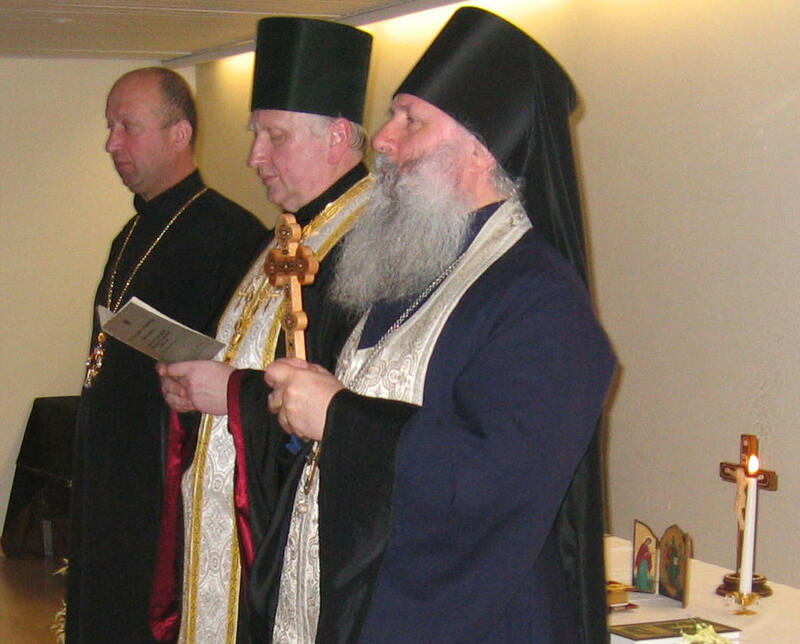 Organized by the Ukrainian Canadian Civil Liberties Foundation, with the support of the Ukrainian Autocephalous Orthodox Churches of Great Britain, Ukrainian Orthodox Church of Canada, the Association of Ukrainians in Great Britain, the Ukrainian American Civil Liberties Association, and other donors, the bronze plaque is adorned with a bas relief of Gareth Jones, prepared by Toronto sculptor, Oleh Lesiuk. 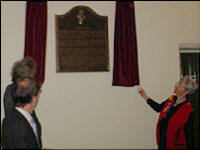 This was the first-ever historical marker including not only the English and Welsh languages but Ukrainian as well. 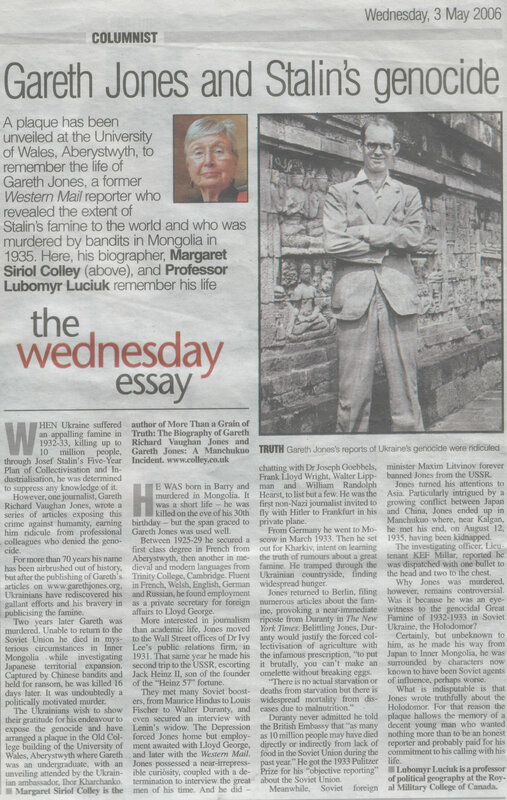 The London Times - 2nd May, page 4 - News - Memorial to Famine Reporter. 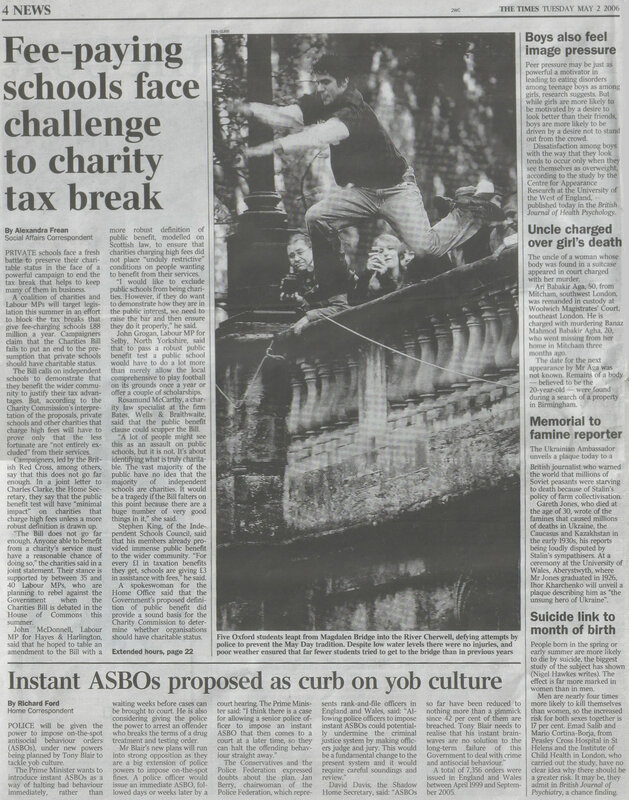 CLICK HERE (full page) - CLICK HERE (for detail). BBC Wales TV - 3 minute broadcast 6.30pm 2nd May 2006 - Presenter; Steve Jones. CLICK HERE to view a video clip on web. Or CLICK HERE for low res video & CLICK HERE for (slow) download 2mb Higher Resolution Video. S4C TV - Wedi7 - 7pm - 2nd May 2006. CLICK HERE to view online (article is at end of programme) .Thanks again to Alun and crew! BBC World Ukrainian Service - 2nd May 2006. Вшанування журналіста, який писав правду про Голодомор CLICK HERE . BBC Radio 5 Live 'Up All Night' Russian Slot - 3.05am Wednesday 3rd May. 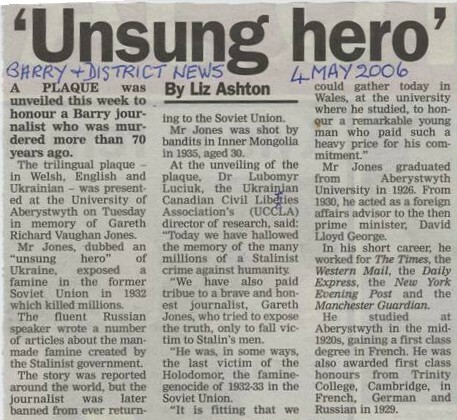 Barry & District News - 6th May 2006 - "Unsung Hero" CLICK HERE. Siriol & Nigel Colley with the Ambassador. Arthur Dafis, Y Wasg a Chysylltiadau Cyhoeddus / Press and Public Relations.